After several years of negotiations, Spain's Repsol YPF, S.A. (NYSE:REP) has signed a multi-year supply agreement for liquefied natural gas with Qatargas Operating Co. Ltd. for the Canaport LNG terminal in Saint John. Khalid K. Al Thani, CEO of Qatargas, and Benjamin Palomo, director of LNG for Repsol, meet in Doha to sign a multi-year LNG supply agreement to bring liquefied natural gas to the Canaport LNG facility in Saint John. Spain's No. 1 oil and gas company, which operates the Port City terminal, won't reveal the expected annual amount of gas to be shipped from Qatar to New Brunswick or how long the deal lasts. "It's very commercially sensitive," said Mary Usovicz, Repsol Energy North America spokeswoman, offering up only that the first shipment is expected before the year is out. Asked whether Repsol's deal with Qatargas was in any way encouraged by news in July that Exxon Mobil Corp. (NYSE:XOM) and partners won't bring online new supplies of natural gas from Nova Scotia's offshore Sable project to extend its life, Usovicz said the agreement with the Qatar firm has been in the works for a number of years. "We're always exploring all our options," Usovicz said. Repsol has committed to taking on new supplies of natural gas from offshore Nova Scotia and has reportedly been interested in exploring for more: In February 2009, Repsol reached an agreement with EnCana Corp. (TSX:ECA) to buy natural gas from the Calgary firm's Deep Panuke wells. And speaking before an industry audience last year, then-Nova Scotia energy minister Barry Barnet said Repsol had expressed an interest in deploying an advanced, deep-sea exploration system to find offshore gas reserves. The Canaport LNG terminal has received liquefied natural gas shipments from Trinidad and Tobago, Peru, Egypt, Norway and last year and earlier this year, received three shipments in total from Qatargas with its Q-Flex tanker. The vessels Qatargas will use to deliver the fuel - the Q-Max and the Q-Flex - are the largest LNG tankers in the world, the Q-Max being the biggest of the two with the capability of carrying about 5.6 billion cubic feet of natural gas. 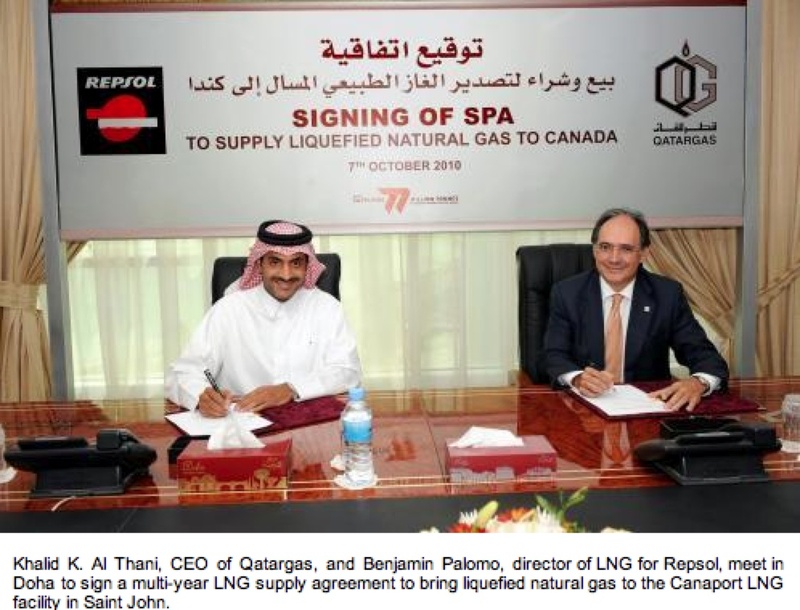 In a statement, Repsol's executive director of LNG Benjamin Palomo said the new LNG supply from Qatar strengthens the company's position in the Canadian and U.S. northeast markets as a "reliable, diversified, flexible supplier of natural gas." Canaport LNG, a regasification terminal officially opened in September 2009 by Repsol chairman and CEO Antonio Brufau, has so far delivered more than 100 billion cubic feet of natural gas to the U.S. northeast, according to Repsol. It has the capacity to send out one billion cubic feet of gas per day and to meet one-fifth of the natural gas demand of New York and New England. The facility is 75 per cent owned by Repsol and one-quarter owned by the family-owned, privately-held Fort Reliance Co. Ltd. - the parent company of Saint John oil refinery company Irving Oil Ltd.
Doha-based Qatargas is headquartered in an Arab country that exports the most liquefied natural gas in the world. Once Qatargas' trains 6 and 7 (LNG projects) come online later this year and early next, Qatar will have the liquefied natural gas production capacity of 77 million tonnes per year.